Part 2 of our Chautauqua adventure was Friday night. Chairmen of the Board was performing and my mom had to go. I was surprised at how many of the songs I knew!!! "Patches I'm depending on you son"..... you know the rest. 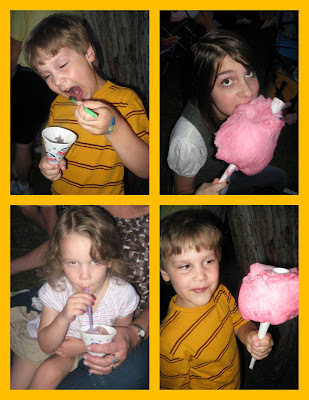 :) So we jumped in the van at 8:30 pm, found a parking spot and settled in with cotton candy and snow cones. 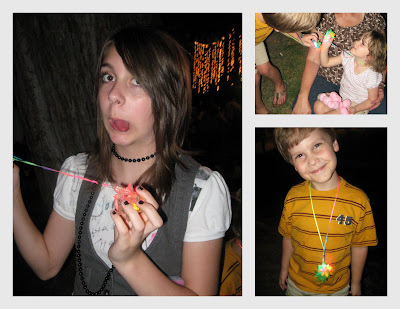 As darkness fell the kids started noticing all the flashing glow sticks and necklaces. So Isaac and I made the trek back to all the little booths that were selling things and got a flashing necklace for him and his sisters. They were cute, but a bad idea on my part. It was like a strobe light and anyone that has migraines knows that strobe lights and migraines don't mix.